“Her heart rate is decelerating with each contraction,” explained the doctor to my husband and me, a grave expression on her face, “and we just saw a major deceleration.” We were rushed into the surgery room for an emergency cesarean section, and just minutes later, we met our first child. After the C-section, we learned the reason for the heartrate decelerations: her umbilical cord was wrapped around her neck, like a noose, four times. We were told the hospital’s record was five. The technical term for her condition was “quadruple nuchal cord.” Were it not for the emergency C-section, she almost certainly would have asphyxiated during delivery and been stillborn. No mother, anywhere in the world, should ever have to lose a child — and thanks to the global decline of poverty and spread of medical technology, fewer do. The specifics of my daughter’s situation may have been unusual, but her survival is an example of a broader trend. Thanks to medical advances, the global rate of stillbirth per 1,000 births has fallen from 24 in the year 2000 to 18 in 2015, with decreases seen in all regions of the world. In my daughter’s case, for example, those advances included external monitoring of the fetal heart rate during labor and a cesarean delivery. Not only has there been progress in reducing stillbirths, but more and more children survive to see their first birthday. The global infant mortality rate per 1,000 live births fell from 65 in 1990 to less than 30 in 2017, according the World Bank. Access to stillbirth-preventing technology, as well as improvements in nutrition and sanitation that decrease infant mortality, are made easier by the spread of economic development around the world. The greatest improvements in infant health have taken place in developing countries as poverty declines and standards of living rise. To understand just how important prosperity is, consider the difference between falling stillbirth rates, which depend on the latest and thus very expensive technology, and falling infant death rates, which are connected to overall economic improvements in developing countries. Poor countries suffer far more stillbirths than rich countries, both in absolute terms and adjusted for population, although the rate is decreasing in both. Using data spanning 1990 to 2010, researchers have estimated that more than 40 percent of global stillbirths occur in sub-Saharan Africa, the world’s poorest region. In fact, 98 percent of the world’s stillbirths occur in low-income and middle-income countries. Less than 2 percent occur in developed regions. In contrast, when it comes to infant mortality rates, sub-Saharan Africa and other poor areas of the world have seen faster progress than rich countries. 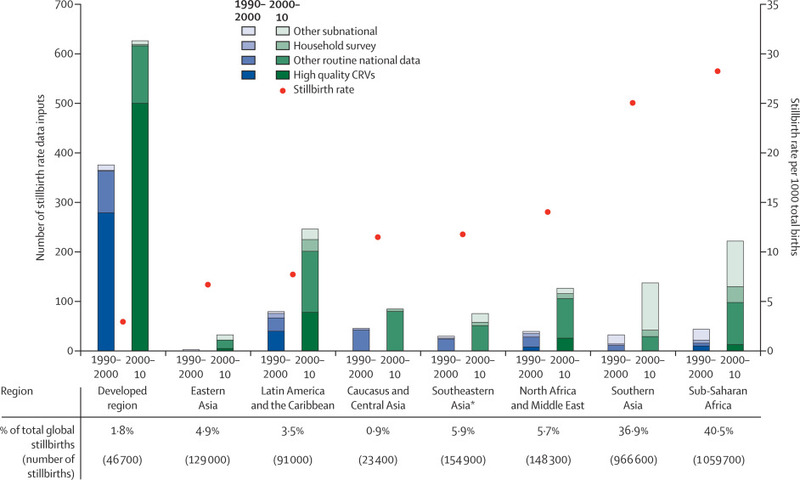 Like the stillbirth rate, the infant mortality rate remains far higher in poor countries than in rich ones. In 2017, it was more than 50 per 1,000 live births in impoverished sub-Saharan Africa, compared with less than six in the wealthy United States. However, as extreme poverty becomes more rare, living standards rise, and small changes in sanitation and nutrition exert a dramatic effect on infant health. Sub-Saharan Africa has more than halved its infant mortality rate since 1990. In East Asia, which saw a rapid decline in poverty following economic liberalization, infant mortality fell by a staggering 70 percent. Overall, children’s odds of survival have improved, but much work remains to be done. Even in wealthy countries like the United States, there are still parents who lose their children to stillbirth or in the first year of life. If hearing of other stillbirths only compounded her pain, it might be of some small comfort to her to know that fewer and fewer people suffer the loss of a child each year. As better monitoring devices and other technologies spread to more medical facilities, and as surgical techniques improve, birth continues to become a safer endeavor for mothers and children. As prosperity spreads throughout the world, more children live to see their first birthday and beyond. Today, my daughter is a healthy, happy, cuddly three-month-old infant. I am forever grateful for the skilled physicians who saved my daughter’s life using modern technology. No mother, anywhere in the world, should ever have to lose a child — and thanks to the global decline of poverty and spread of medical technology, fewer do.